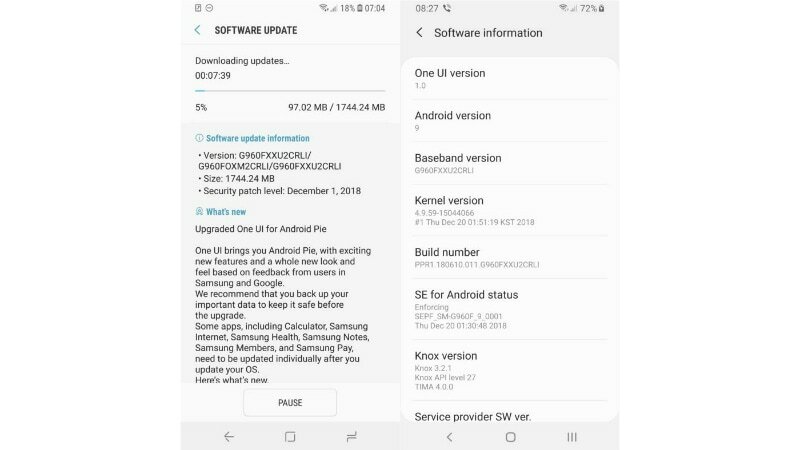 Samsung Galaxy S9 and Galaxy S9+ have now started receiving stable Android 9.0 Pie update. The latest Android update is reportedly rolling out in Germany. It is said to be available for the users who are currently on Samsung Experience UX based on Android Oreo as well as those with the One UI beta on top of Android Pie. The new update is notably ahead of the formal schedule as Samsung had originally planned the Android Pie update for the Galaxy S9 and Galaxy S9+ models alongside the Galaxy Note 9 for January. As SamMobile reports, the stable Android 9.0 Pie update for the Samsung Galaxy S9 and Galaxy S9+ is rolling out in Germany with build number G960FXXU2CRLI and G965FXXU2CRLI, respectively. The update is said to be available for both Android Oreo and Android Pie beta users. The changelog available in the SamMobile report shows that the Android 9.0 Pie update for the Samsung Galaxy S9 and Galaxy S9+ comes with the December 2018 security patch. The update also apparently includes the One UI version 1.0 with an all-new look and feel that is mainly designed to offer you an enhanced one-handed experience. Further, the Android 9.0 Pie update for the Samsung Galaxy S9 and Galaxy S9+ is a little more than 1.7GB is size. The update is expected to bring some of the core Android Pie features, including the Dark Mode and Slices among others. If you're using a Germany version of the Samsung Galaxy S9 or the Galaxy S9+, you can check the availability of the Android 9.0 Pie update by going to Settings > Software Update. SamMobile has also provided downloadable versions of the latest firmware package. Last month, Samsung announced that it is set to release stable One UI based on Android Pie for the Galaxy S9, Galaxy S9+, and Galaxy Note 9 in January next year. That announcement was made at the company's annual developer conference in San Francisco, California, alongside revealing One UI as the next proprietary software skin by the South Korean giant. Moving with the original plans, Samsung earlier this month released One UI-based Android Pie in beta for the Galaxy S9 and Galaxy S9+. The company also pushed some bug fixes in the recent past, based on the early feedback, to set the stage for the final release of Android Pie. It is worth noting here that while the Android Pie update for the Samsung Galaxy S9 and Galaxy S9+ is rolling out in Germany, users in other markets may have to wait for some time. We weren't able to spot the arrival of the latest update on one of our teammate's Galaxy S9 at the time of filing this story. We've reached out to Samsung India for details around the stable Android Pie update for the Galaxy S9 and Galaxy S9+ and will update this space accordingly. Is Samsung Galaxy S9 the most value-for-money flagship phone in India? We discussed that on Orbital, our weekly technology podcast, which you can subscribe to via Apple Podcasts or RSS, download the episode, or just hit the play button below.